Legendary race horse Rachel Alexandra is reported to be in serious condition today after undergoing surgery at Rood & Riddle Equine Hospital in Lexington, Ky. The seven-year-old mare gave birth to her second foal, a filly by Bernardini, on Feb. 12 at Stonestreet Farm in the Lexington suburb of Versailles. 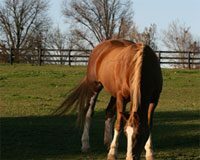 The surgery was performed to repair an area of bruising in her colon sustained during the foaling. Dr. Brett Woodie of Rood & Riddle, who performed the surgery, stated that her prognosis was unknown, but her condition is “serious.” Her filly, who weighed in at 140 pounds, is healthy and is currently at Stonestreet Farm with a nurse mare. Rachel Alexandra also spent some time at Rood & Riddle after the birth of her 2012 colt, now named Jess’s Dream, as a precautionary measure for pain management. Rachel’s career includes a 20-length victory in the 2009 Kentucky Oaks and a win in the Preakness Stakes that same year, a rare feat for a filly. 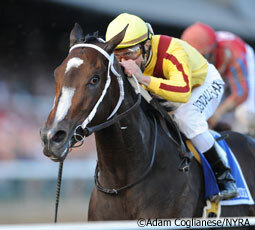 Her accomplishments led her to being named 2009 Horse of the Year. She was purchased by Jess Jackson and is now owned by Jackson’s widow, Barbara Banke. I LOVED that filly! Watching Rachel run was like watching Secretariat. She’s beautiful and full of heart. All my prayers and best wishes for her, her foal and her human connections. We are praying for you Rachel! Gods mighty hand will make you well! It did Paynter and it will you to! Praying for Rachel and her owners :(. Hoping she gets better soon…. :)! Oh how scary! I sure hope this amazing mare will be okay.